The Republic of Croatia is monitoring its fishing fleet along the shoreline of the Adriatic Sea by using ArcGIS to track and monitor vessels. GIS will help the country meet the European Union’s stringent fisheries policy. VMS is an open system compatible and easy to integrate with existing GIS environment and informational systems. The European Union (EU) requires that fisheries be sustainable and not jeopardize fish stocks for future generations. Even so, Europe’s fish populations continue to decline. Therefore, the EU Commission Reform of the Common Fisheries Policy (CFP) has been assessing the way EU fisheries are managed and the challenges they face. The commission concluded that the main contributor to overfishing is that the fleet’s fishing capacity is greater than its fishing opportunities. To counter this problem, the commission has recommended baseline standards that will reduce the fleet’s capacity, including the gross tonnage of a vessel, gear selectivity, trawler equipment, twine thickness, and so forth. It also recommended stabilizing fish stocks by implementing catch quotas by species, creating seasonal closures, and restricting access to areas where young fish are developing. In addition, the commission noted that waters need to be managed within a regulated transparent and sustainable framework so they are not overfished. This is easier said than done. Tracking vessels and monitoring catches can be an overwhelming task. In 2010, the EU’s 27 member countries registered a total of 83,796 vessels. 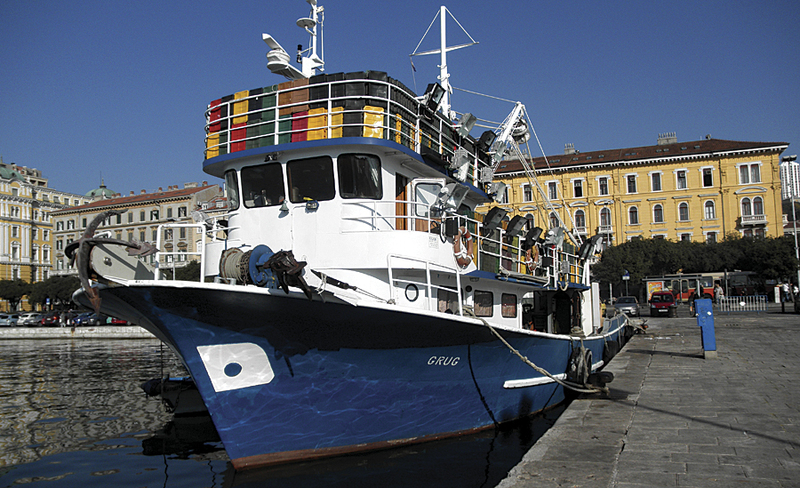 Fortunately, the EU’s soon-to-be newest member, the Republic of Croatia, has an effective GIS fishing industry solution that helps it monitor vessels, gear, catches, seasonal fishing areas, and more. Croatia’s Ministry of Agriculture, Department for Fisheries, asked GDi GISDATA LLC, Esri’s distributor in Croatia, to build a geoinformation system for fisheries. GISDATA developed the Vessel Monitoring System (VMS). The department uses it to identify and track the country’s 260 large fishing vessels. This information can be used for monitoring boat activity and as evidence for law enforcement. The main components of VMS are the department’s centralized database, tracking devices, and ArcGIS. Whether at the department, in the harbor office, or on a boat, an inspector can access the GIS to track a vessel and get information about its owner, type, and gear on board and a host of other information. The fishery information system, built to accommodate the EU’s fisheries registry requirements, includes nine data modules. It is capable of providing additional information for various other uses. The person-register module contains ID numbers, owner information, and fishing licenses, as well as vessel information, such as title, registration, length, gear, and equipment. In accordance with the EU regulation, Croatia’s fleet register keeps track of the vessel’s entire life cycle from entrance to and exit from the fleet. Every data change for the vessel is recorded as an event, thereby keeping the entire fleet database current. A catch module includes information that fishers complete on an inquest register, as well as descriptions of the catch, catching effort, and rejected catch. An analyst can filter the catch module by date; regional unit; type of sea organism; fishing gear; and vessel type, length, strength, and weight. This gives the analyst a good picture of the relationship of fishing capacity and fishing opportunities. The first sale module is used to compare catch data with sale data to reveal any discontinuity. The blue diesel module monitors fishing vessels’ fuel consumption to gasoline quota. The aquaculture model contains fishers’ preferences for farming freshwater organisms, and the marine culture module holds breeding site data. Other data modules include the sport and recreational sea fishing license, tuna fishing, and administration. An overview of the last available positions of every vessel gives the Department for Fisheries a near real-time picture of vessel activity. Detailed information about a vessel is quickly accessible. 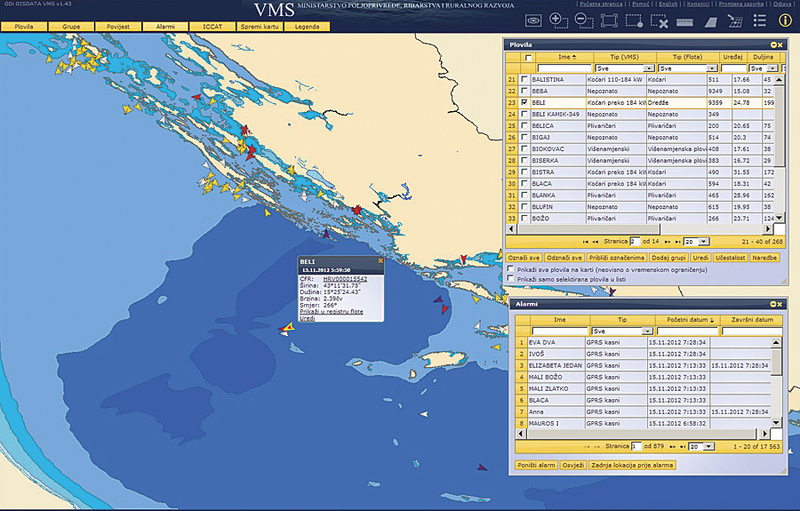 VMS in the Adriatic Sea is used to acquire, send, edit, and process data. Large vessels 14 meters or longer have onboard tracking devices that send vessel data to the database via general packet radio service (GPRS) and SAT (Iridium) satellites in different time intervals. GPRS/EDGE/UMTS (depending on signal quality and strength) have been customized to send data every 15 minutes or less (remote control) and over SAT every two hours. Users are then able to review and send detailed data reports about a vessel’s position, speed, type, and so forth. Along with this, basic users can selectively manage and track historical and up-to-date data through filters and alarms. Alarms are divided into system alarms and spatial alarms alerting the department of problems in protected, forbidden, or time control areas. Alarms are automatically transmitted as text messages to inspectors in the field. The application also gives users tools to perform analysis, such as determine a path or calculate fuel consumption. They can also choose raster or vector data background layers and generate reports. VMS is an open system based on standards and is compatible and easy to integrate with existing GIS environment and informational systems. It supports distributed workflows in the central office of the Department for Fisheries, county offices, and fishing vessel business offices. Croatia can now use the system to study the impact of aquacultures on the environment. And in the event of a storm, responders can alert vessels and rescue vessels in distress. For more information, contact Mr. Andrej Loncaric, managing director, Core Markets, GDi GISDATA.